The author on the steps of the Münster. I am currently on exchange at the Ruhr-Universität (RUB) in Bochum. This is my second time studying abroad, and the third country that I have been fortunate enough to study in. From January until mid-March I took part in an intensive language class, wherein I developed basic language skills and worked closely with other incoming students who faced the same challenges I did. 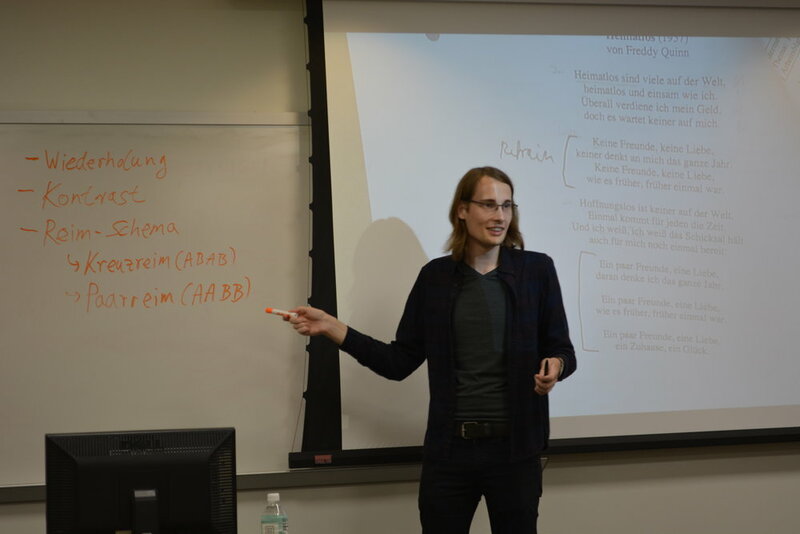 The class was often difficult though enjoyable, and friendships were forged over our mutual struggle to comprehend the mysteries of German grammar. Much of my first months here were also spent making use of my Semesterticket, a train pass that allows students to travel throughout the region for a very affordable one-off fee. 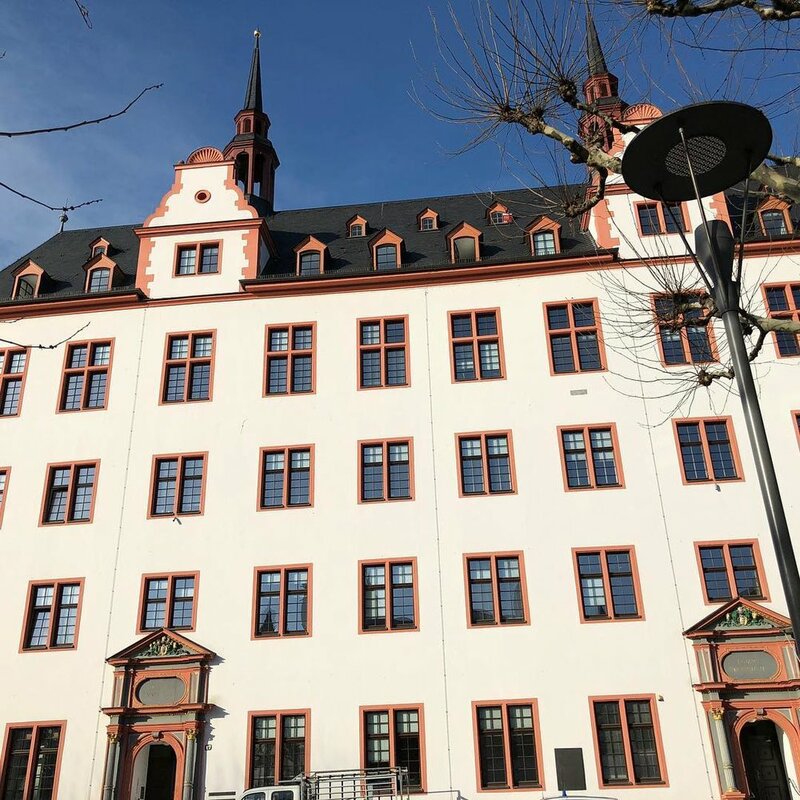 My state – Nordrhein-Westfalen – is the largest in Germany, and with my Semesterticket I have been fortunate to explore the cities of Köln, Dortmund, Bonn, Düsseldorf, and more. This ticket has offered plenty of extra-curricular opportunities to develop my language skills and gain some understanding of everyday life in Germany. The benefits of this pass are many; in fact, one can probably learn as much from traveling around the state than from work in the classroom. That being said, all of the homework in the world could not have prepared me for Karneval, a time during which the citizens of Düsseldorf, Köln, and more take to the streets and are gripped by a sort of collective insanity, souped up on copious amounts of alcohol and high-quality German sausages. I’m told that the festivities have a connection to the Catholic celebration of Lent, though it is unclear exactly where Jägermeister fits within the liturgical calendar. Garish costumes are worn as the revelers celebrate their civic pride; the cities resemble a Game of Thrones battlefield, soundtracked by Kölsch lager and pounding techno music from the 1990s. It is an incredible amount of fun. Of course, this being Germany, all festive debris is cleaned away in an orderly fashion, and everyone returns to work on Monday morning as if nothing happened. Thankfully, Karneval comes but once a year, and, after all, there is serious work to be done. My academic experiences so far have admittedly been very challenging. Class discussion is held in German, and though there is not much expected of me in terms of contribution, even trying to keep up is very difficult. Class formats are also different than in the US, and great importance is placed on your ability to independently conduct and present original research. The campus at RUB is labyrinthine, and with its brutalist architecture from the 1960s and dour winter weather, even finding your way around can initially be intimidating. However, rising to these challenges is a privilege, not to mention a great opportunity. Living and working abroad forces you out of comfort zones and demands that you adapt to new experiences; moreover, the opportunity to cultivate connections and network with like-minded academics is also a bonus. The faculty here have been welcoming and are extremely helpful in providing guidance and advice. I have been fortunate enough to study abroad before and believe that being able to study in an atmosphere which demands hard work truly offers an opportunity to thrive. And if it all becomes too much, there is always the option to chill out and eat a pretzel. Lesson learned. Last week, the CMU History blog went on a short hiatus. The reason was my journey to London, where research in the British Library and the National Archive in Kew waited for me. This second part of our double feature on archival research is a loose collection of experiences in and around the archive. Sad Catalogues, or: A Thief in the Night? 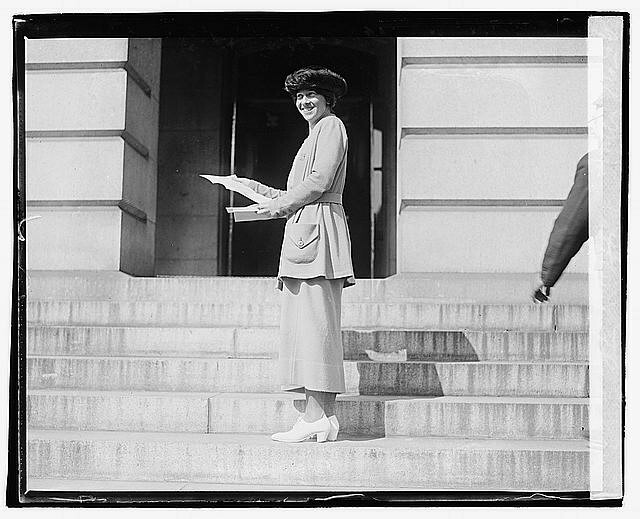 Microfilm could be such a great resource. It can contain a rather large amount of copied source material, doesn’t take up much space, and exudes a certain flair of actual research that reading sources on a computer thousands of miles from any archive just doesn’t have. Microfilm also must be catalogued carefully, ordered, and put into neat boxes for future examination. The downside is, however, that anyone who might want to use microfilm has to look at a lot of material before that hoped-for slide might come up. In my case, nothing came up. While looking for an early 18th century London newspaper, I thought I had finally found the issue in question, when it dawned on me that the actual page was missing. The curator who had created the microfilm had surely been aware of that, since he or she had left a neat space in-between the other pages. Perhaps they had hoped that the page would be found one day, and subsequently added to the film. That day seems very far away, however. Since the librarians of the British Library are helpful and very nice, we spent at least an hour going through the catalogue and two separate backup collections to find the missing page. In the end, the librarian had to politely admit that the catalogue had perhaps been a bit boastful in announcing that the British Library held the most important, complete collection of early English newspapers. On top of that, while doing some further research online, the creeping suspicion came over me that the newspaper’s originals were actually held by the Library of Congress all across the ocean where I had initially come from for the purpose of finding those very originals! Now, I don’t know why anyone would take a whole host of early 18th century newspapers and smuggle them over the ocean to the new world, but if that person could please step forward and hand over that missing page, I would be very grateful. Of course, as we all know, if I went to Washington and found that page, all it would tell me would be things I already knew from other newspaper entries. That’s how 18th century sources always are, you just can’t trust them. If you are lucky enough to find yourself at a library or archive with an attached museum or exhibition, take the time to rest your brain (and eyes) a little and take a stroll. Often you might see or hear things that can make your day much better. Shortly after quietly cursing the widespread crime of newspaper theft, I ventured into the heart of the British Library for a nice visit to the Magna Carta. Sadly, the museum didn’t have it on display at that time (and I must be honest in saying that I completely forgot to ask why), but there was a very chipper tour guide who gladly told the interested visitors about another, recently discovered Magna Carta. Apparently, some (very rich) guy had found a box in the attic of his newly acquired (ancient) house (well, palace). He had taken its contents, among them a massive scroll, to the local public library of the town of Sandwich, where the astonished librarians realized that the scroll was in fact a 1217 version of the Magna Carta. According to the British Library guide, the librarians told the lucky finder that he could offer the scroll to the British Library, which would give him 20 million pounds for it. He could also, however, give it to a private collector from America or China, who would surely give him over 100 million pounds! The owner of the scroll, shaking his head, declined both suggestions and simply gave the Magna Carta to the public library – for free. What a man! The story remained in my head for a couple of days, before I decided to do some more research on it. Strangely, the only article I could find about a newly found Magna Carta in Sandwich dated from 2015 and described how a 1300 version was found in the archive… Which only goes to show that you can’t trust museum guides either. While daydreaming about finding my own treasure worth 100 million pounds, I ventured out into the courtyard of the library for some air, when I was suddenly confronted with a rather large group of people dressed in white and waving Ethiopian flags. Singing and dancing, they made their way towards the library. I decided to walk with them, because I had just researched the Ethiopian-German relationship in the First World War, and out of sheer curiosity. 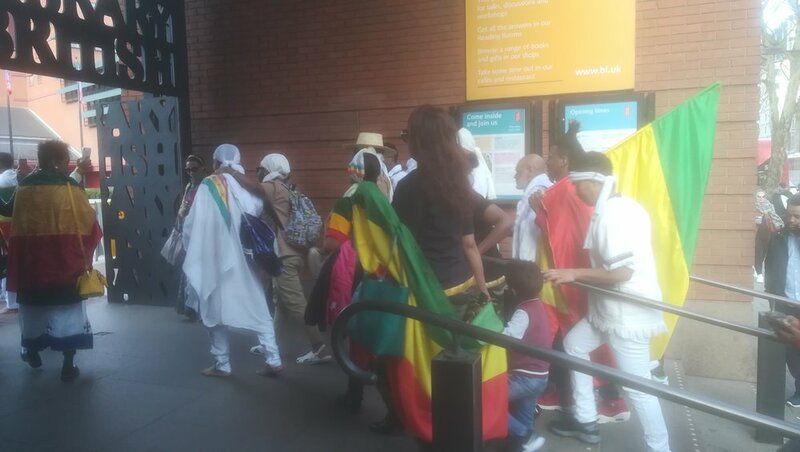 Inside the building, the group visited the “Treasures of the British Library” exhibition, where they gathered around the priceless Ethiopic Bible, the 17th century Octateuch of Gondar. Feeling as if I should know why they celebrated this day, I still had to ask one of the Ethiopian celebrants about the significance of their visit. Beaming, he told me that Ethiopia had never been colonized, and that it had decisively defeated the Italian invasion at Adwa, on March 1st, 1896. Of course, it wasn’t such a coincidence – after all, the day is celebrated all over the world by people of the Ethiopian Diaspora – but I felt as if my struggle in the archive for this day was somehow vindicated. 123 years of Adwa matter, as a sign for the struggle of people all across the world against colonialism, and as a symbol that this struggle hasn’t yet ended. Having been required to use a large number of archives in two different continents during my joint research assistantship for the Buffalo Bill Center of the West (Wyoming) and PhD research at the University of Strathclyde (Scotland), I thought that talking about my experience and giving out some practical advice could be of use to some of the students in the Comparative and Transnational history program at Central Michigan (of which Strathclyde is one of the partner universities). Coming from a background in Foreign Languages and Cultural Studies, I had little previous experience with collections, foundations, or national archives (both in the U.S. and Europe) when I began this project, and—in all honesty—I would have treasured a few pragmatic tips on how to approach and what to expect from each of them. So here I am, I hope this post can help some of you avoid a total ‘research freak-out’ when you are thousands of miles away from home and from your beloved supervisors. Let me begin by saying that participating in a big transnational research group such as the ‘Papers of W.F. Cody’–researching the life and times of Buffalo Bill Cody—was no doubt a thrilling experience, but also a challenging one. 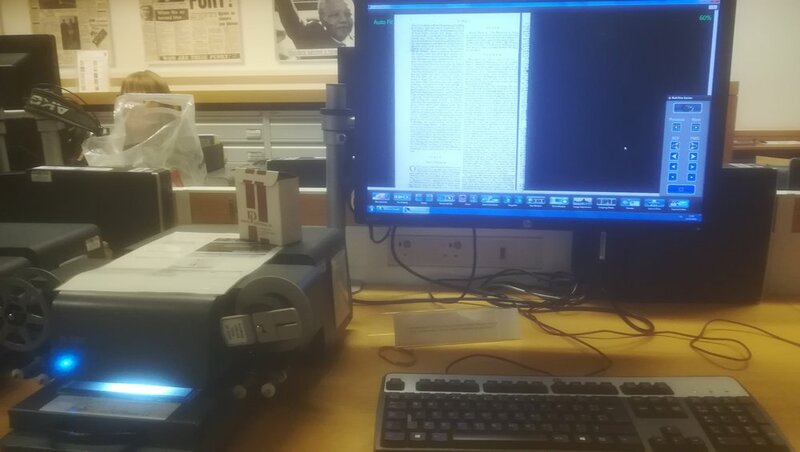 And while meeting international scholars (such as Patricia Nelson Limerick, Louis Warren, Robert Rydell) was electrifying, so was getting a shock from the Microfilm machine in the National Library of Rome, alas not in the same way. Regardless of the picaresque journeys to get there— long transatlantic travels with plenty of missed connections and the odd interstate bus ride with Greyhound (Laredo-Denver, I’ll never forget you)—I have to admit that my experience with American archives was, luckily, always ‘easy peasy’. As some of you might already know, research collections are carefully indexed in most major American repositories, and a thorough preliminary search will make you fairly certain that your hunt will be successful. Professional archivists working in specific collections will also provide invaluable help, so make sure to reach out to them and explain precisely what you are looking for. They might be able to show you additional material on your topic which is contained in boxes that, for whatever reason (a misleading nametag or vague description), had escaped your initial search—as it happened to me in Denver Public Library. Generally, the staff working in large archives and libraries is abundant, and the distribution of the material and the opening times are user-friendly, with some repositories operating also during the weekend. This will allow you the chance to use your time at the archive to the fullest, especially if you are on a tight schedule due to long commutes. Furthermore, an increasing number of museums and archives now have digitized copies of some of their items, which, in some instances, will remove the need to actually visit the archive—at least for some time. This brings me to a tip that will save you some trips to Europe: Major American archives (Library of Congress, Smithsonian Institution, Newberry Library, Huntington Library, Archives at Yale and Stanford Universities) have copies of collections and documents held in European archives. So, even if you are researching a ‘European topic’, it is worth to first take a look in US archives as they are generally rich in European collections. However, the downside is that this material has probably been studied extensively before, and, unless you approach your topic from a particularly revolutionary angle, you take the risk of not being wholly original in your study. So, if the aim of your research is to examine original or little-known documents or to uncover previously unpublished primary sources, my recommendation is to cross the pond and start rummaging in some dusty European archive! And this is when the challenges began for me! 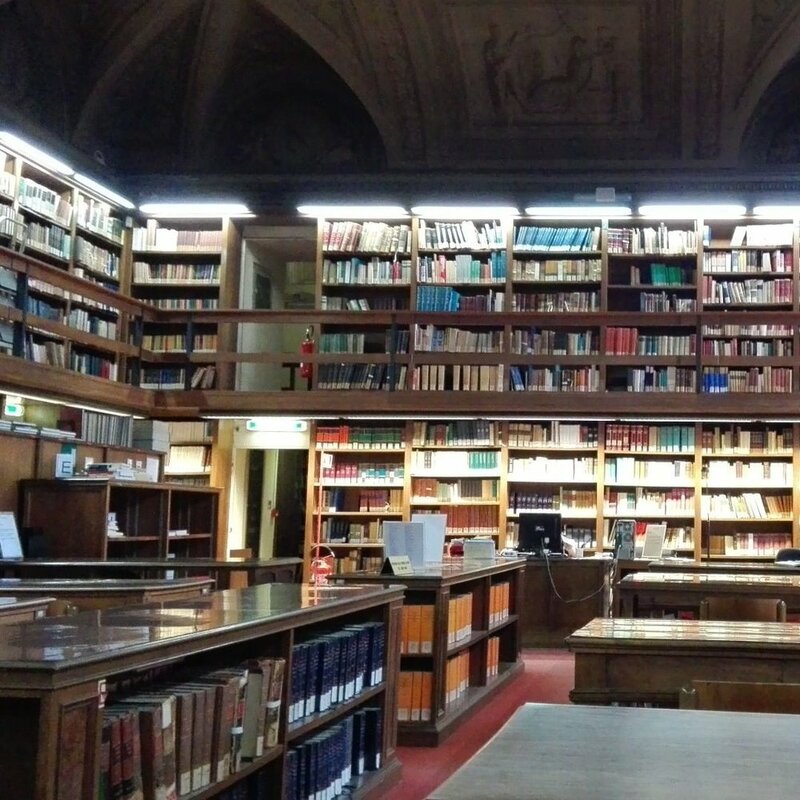 The way archives function in Europe varies from country to country, from institution to institution, and even from whether the archive is state-funded or financed by a private foundation. The organization of British archives and libraries is the one which resembles most the American system. The British Library, the National Archives, the National Library of Scotland, and the British Film Institute archive all have professional and semi-professional staff to assist users in their search. Several holdings are available digitally to users, both on and off site (including index cards, manuscripts, and newspaper collections). Besides that, the distribution of documents is frequent, and normally very quick. On the other hand, the reproduction of material can be rather costly (printing and scanning) but taking copies with your own devices for study purposes is allowed and it is free—although check how many pages of the documents/books/stills you are allowed to copy, each archive implements different policies. When it comes to archives in continental Europe, the rules and organization change significantly. First of all, do not expect to always find staff who understands and speaks English. Although this might be more common in archives in some central-northern European countries (the Netherlands, Denmark, Switzerland, parts of Germany, large French archives like the BNF in Paris), it is much more infrequent in central-southern and eastern European countries. You are researching a transnational topic, so ideally you would already have some skills in the language of the country you are visiting. If you don’t, I strongly suggest getting a research assistant/fellow PhD student/friend who is a fluent speaker (or, even better, who is based in the country) to assist you during your archival visit. The best way to achieve this is to meet international students, at university, during conferences or summer schools – so make sure you polish your networking skills! Take into account that opening times often don’t include weekends, especially in countries like Germany, Italy, and Spain where everything shuts down on a Sunday, and that some archives might close as early as 5pm. Also, the distribution of material is sometimes limited to specific days and even specific times of the day (just mornings or just afternoons, or, for instance, only between 9 and 11 am and between 2pm and 4 pm), and that some material needs to be booked a few days before the day of delivery because it comes from an external warehouse (as in, for example, the antique newspapers collection of the National Library of Florence). So, a preliminary thorough check of the archive website and borrowing rules are fundamental—also to make sure you don’t get there on a national holiday or when the archive is closed for restoration (which happens often in archives held in historical buildings). It is good practice, especially in smaller archives, to preemptively announce your visit via email to the curator/archivist responsible for the specific collection you need to use. The staff will normally be able to prepare the material for you and reserve a space in the consultation room. Indeed, you will find that certain archives, despite housing generous collections, have very restricted spaces for the consultation and only accept visits via booking. Don’t expect to find ‘cutting edge technology’ in all the repositories, especially if they are state-funded archives or libraries (which in certain European countries are notoriously underfunded, and understaffed). Internet and computer access are now generally available everywhere, but probably the Microfilm machines will be from the 1980-90s (don’t be like me and make sure you always dry your hands well before you use them, otherwise get a good life insurance). After years of lagging behind, the digitization of archival material, and especially of newspapers, is now efficient in several major European archives. However, most state-funded repositories have gargantuan collections and only a fraction of their holdings is online. The situation is usually better in the archives of private foundations, which might have smaller holdings but are equipped with professional archivists with meticulous knowledge of their collections. In my personal experience the document retrieval process was always quick and efficient, so my advice would be to privilege this type of archive and go to state-funded archives if the items you are looking for are only held there. So, as a rule, you do have to face a number of challenges when you decide to research in European archives. Arm yourself with a lot patience, never lose confidence in your abilities and keep persevering. Having a flexible mindset will help a great deal when you are there. Sometimes you just have to accept that certain things are beyond your control and, no matter how well organized you are, the unexpected will just happen (like when I was in Rome and my archive suddenly shut down due to the first snowstorm hitting the ‘eternal city’ in 27 years). However, I am certain that the rewards, especially for transnational scholars, outnumber the obstacles. Europe is a goldmine for historical records and the chances to come across some truly original material, or at least sources that have never before been studied by English-speaking scholarship, are extremely high. This will make a whole lot of difference in the quality of your research and, eventually, in the way your work will be received by the scholarly community. As the semester and year come to a close sadly so does my time as the editor of [Re]collection. Though there are still a few weeks before the end of the year, this is the last time that I will write a personal post on this blog. Therefore thought I ought to give a few words of salutations before passing the torch to the more-than-capable Marcel Haas. I have learned a lot in my six months as editor and have greatly appreciated all of the authors and readers that make this blog a point of interest. I could spend the rest of this post describing the mechanics that go into editing and managing a blog: copy editing, working with peers and senior colleagues, managing deadlines, keeping an eye out for tone of writing, scrambling to get the final touches on a post, and much more. But I am sure that many of you are familiar with this process already; in fact, I can imagine a great deal of our readers are academics themselves and are therefore all too familiar with these processes (and more). So rather than spend any more time on these matters, I have decided I am going to share a parting story from my own research and teaching interests. My hope is that this story will be interesting and serve properly as parting words for my time as editor. In May of 1244, Thomas Aquinas decided to leave his cushy life assured of future ecclesiastical appointments and to join the Dominican order. Perhaps this change of heart is all too close to some of our own lives – leaving a life of potential financial and professional success for headier pursuits (i.e. signing up to spend half a decade of your life getting a PhD). As he left, Thomas utterly stunned his family who worked so hard to set him off on the right track. Regardless, Thomas followed his calling and trudged on. In fact, he did not trudge at all – he became one of the most prolific writers in medieval European history. Historians estimate that, during his prime, he was producing two to three novel-length volumes per month. Most readers will likely recognize Thomas’s name from his life’s work, Summa theologiae– a tome that addresses over 4,500 theological questions and was meant to replace the outdated Sentencesof Peter Lombard. Curiously, though, Thomas never finished his magnum opus. This fact is curious because Thomas simply decided to stop writing seemingly out of the blue. On December 6, 1273 (not that long from today’s date, albeit 745 years later), Aquinas is reported to have said, “After what I have seen today, I can write no more, for all that I have written is straw”. Historians are not sure exactly what it was that Thomas saw and why exactly he had such a dramatic change in perspective. Dying three short months later in March 1274, some speculate whether it was some sort of medical diagnosis. Nevertheless, Thomas stepped away from his enormously productive career at the height of his powers. More critically though, he did not finish what seemed to be his life’s work. Thomas’s halt in writing has fascinated historians and theologians for years, and it remains puzzling to this day. I share this story not to draw any parallels between the theological giant Thomas Aquinas and my own time at [Re]collection. Nor do I plan to offer any new answers as to Thomas’s sudden stoppage of writing. What I find most fascinating about this whole story is how Thomas continually displays what he thinks is a realistic perspective on his own legacy. He is reflective and even self-deprecating as he halts his projects to engage in more contemplative pursuits. This is especially true if he did not know that he would soon pass away just a few months after ceasing writing. A general point of application that I draw from this story, and, by extension, offer to you as readers is to have the proper perspective as you reach the end of the year. Whether it is with professional goals, writing projects, grading, or end-of-year holiday hustle, be sure to not overestimate how critical every detail is. Remember that you will always experience a mix of failure and success – perfectly embodied, I believe, in my time here as the editor. 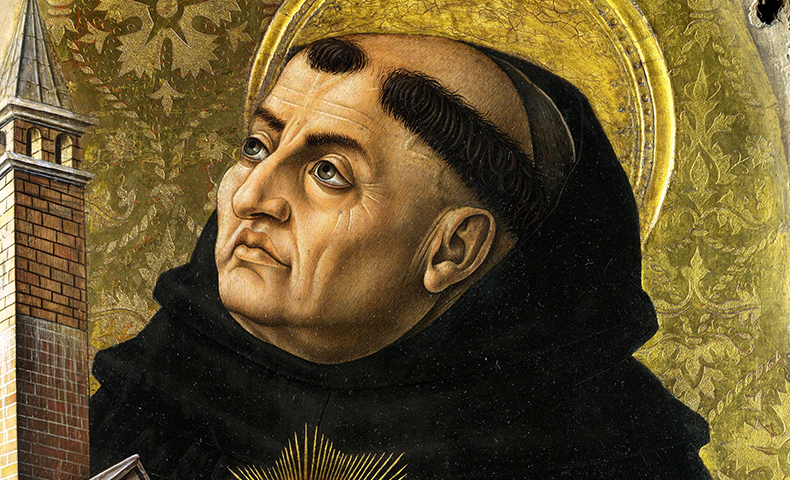 If even Thomas Aquinas gives himself a thoughtful critique and reflection, so can you too. So, as I wrap things up in the next few weeks, I hope that the posts over the past few months have been a little more than “straw”. At the same time, I know that it has been a productive season. Thank you all for all of your support – especially former editor Chiara Ziletti and everyone in the History Department at Central Michigan University. Finally, I wish my colleague and future editor Marcel Haas all the best in the coming year – viel Glück mein Freund! As a PhD student in the history department you expect to be a teaching assistant for much of your time in the program. Recently, however, the History Department at Central Michigan University has partnered with the Clarke Historical Library and the Michigan Historical Review to open up new opportunities for PhD students to embrace possible alternative careers to being a tenured professor. As the job market remains ever so thin, this opportunity is particularly helpful in offering training for careers outside of traditional tenure-track positions. As one of the first PhD students to be granted this opportunity, let me take some time to describe my responsibilities at the Clarke Historical Library…my new home away from home as Frank Boles has so wonderfully called it. Simply put, arranging and creating exhibits is hard, detailed work. Anyone that thinks it is anything less than stressful (but enjoyable) up until the last minute is likely still enjoying the euphoria of finishing a project to give an accurate assessment. While exhibit curators and designers are fun people to work with, there is a lot of negotiation throughout the process. As historians we hope to see all elements of our research make it into an exhibit, but it is simply not possible to do so. 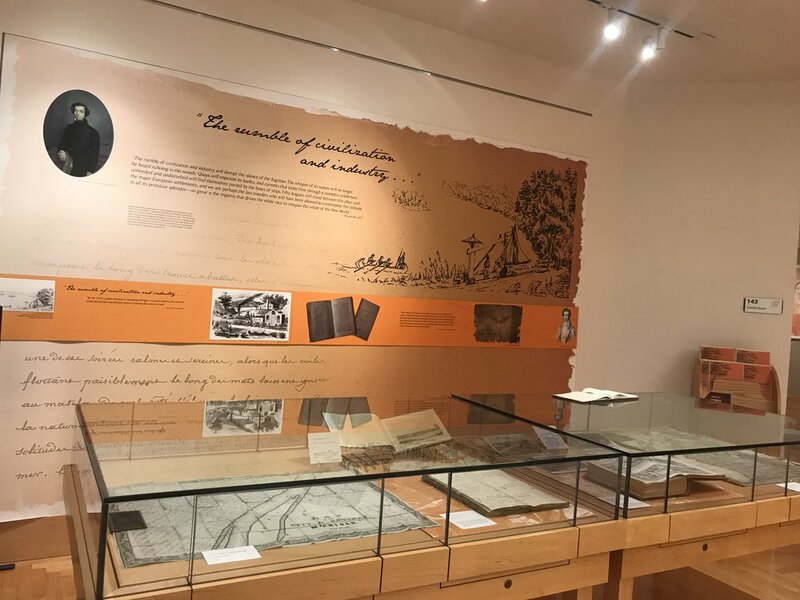 That leads me to the Clarke’s Fall 2018 exhibit: Tocqueville’s Two Weeks in the Wilderness. The idea for the exhibit itself began with United States District Court Judge Avern Cohen. Alexis de Tocqueville visited Michigan in the 1830s. 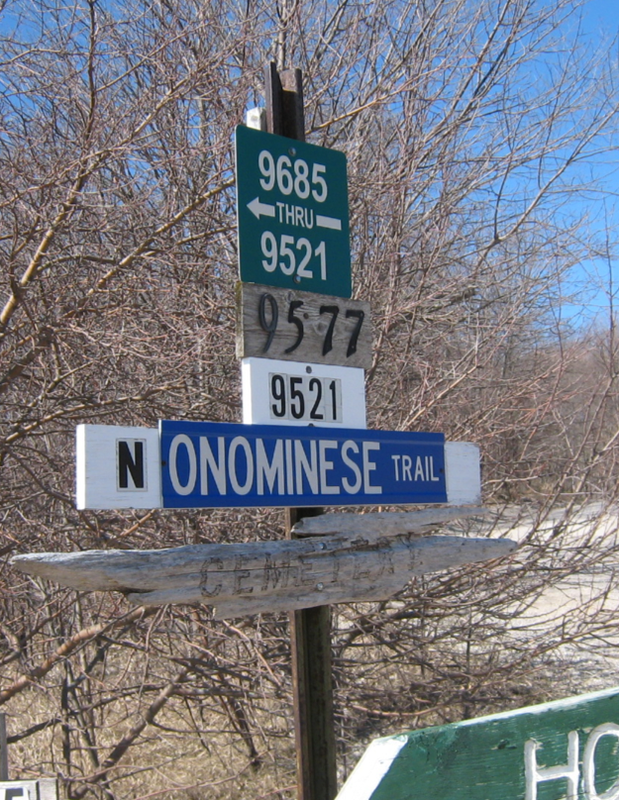 “Two Weeks in the Wilderness” or “Quinze jours dans le désert,” describes the journey he and Gustave de Beaumont took along the Saginaw Trail in 1831. “We are going with the intention of examining in detail and as scientifically as possible the entire scope of that vast American society which everybody talks about and nobody knows.” Enamored with the vast forest and wilderness of Michigan, he described the interior of Michigan with great admiration: “While exploring this flourishing wilderness...you feel only quiet admiration, a gentle, melancholy emotion, and a vague disgust with civilized life. With a sort of savage instinct, it pains you to think that soon this delightful solitude will have been utterly transformed.” Tocqueville’s travels in Michigan were part of a commissioned trip to the United States to examine the prison system. However, his true aim was to explore the untapped outer limits of civilization was only made clear upon his arrival. Despite only being part of about half of the process for this exhibit, it is challenging nonetheless. The excruciating detail and time-consuming activities make a time crunch almost inevitable. Nonetheless, I had so much fun. 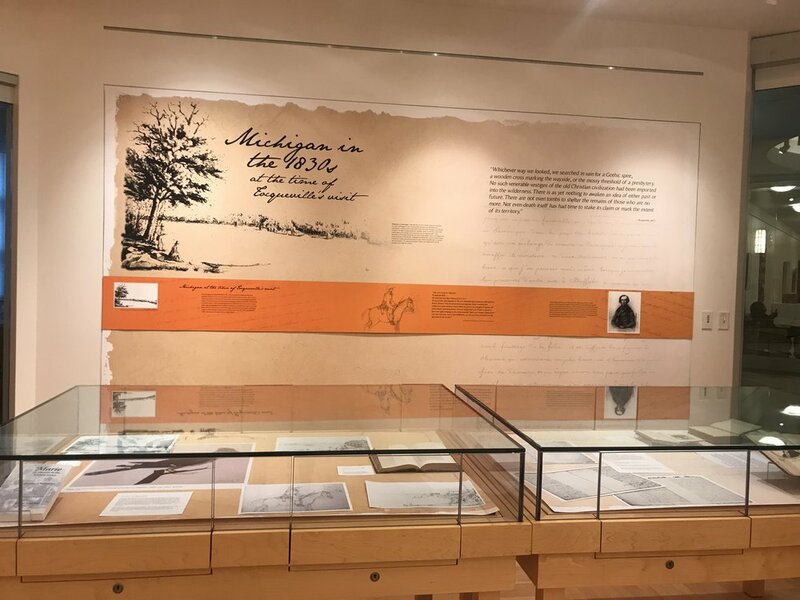 Hands-on work and practical applications of history and the training that we get in the history department are put to the test not to mention an ability to create statistics about Michigan in the 1830s from scratch. This particular exhibit is marvelous (and I don’t just say that because I helped). It is the result of hard labor and a lot of fun exploring stacks and running back and forth from the printer doing last-minute labeling. Another fun perk is that the Clarke’s very own Bryan Whitledge is now on a first name basis with the Countess Stephanie de Tocqueville, so that’s pretty cool too. In summary, the Clarke has one of the nicest housing spaces for exhibits that I have seen in any university library (in my limited experience). With this, they have a unique ability to showcase collections and exhibits, work with departments, be an archival library, and house a journal. You should check it out! If you ever wondered whether immersing yourself fully into academia is a good idea, this week’s post has some ideas that might convince you to do so. Let me begin by saying that I truly enjoy going to conferences. Think about the fact that the university allows you to go on a short holiday where you meet some interesting people, make great new friends (who can also be quite influential and helpful), and all you have to do is give a short presentation and listen to why people think that you should use different sources. Conferences become even more enticing when they are held in a different country than the one in which you are currently working. In my case, that foreign country was Mexico, and that conference the Annual Meeting of the American Society for Ethnohistory (of which I am a shiny new member). Right away, I felt the rush of oncoming adventure when my plane touched down on the runway of Oaxaca’s Xococotlán Airport and I emerged into October’s tropical heat. The conference took place in a comfortable hotel a little outside the city center, which commanded a magnificent view of the valley. Oaxaca is an incredibly beautiful place that boasts architecture from the Spanish colonial era as well as modern art, markets, and restaurants that overlook the tremendous sight of ancient Monte Alban. The latter truly feels like the city of the gods it was meant to resemble. Built entirely upon the peak of the central mountain of the valley (which had been razed to create a massive plateau), it surely takes its place besides Mexico’s other archaeological highlights such as Teotihuacan and Palenque. As a center of art, culture, and history, Oaxaca was the ideal place for a very special conference. The Society for Ethnohistory is generally focused on examining the history of Indigenous peoples of the Americas, but more specifically highlights the agency and achievements of Indigenous people in interaction with the colonizing Europeans (the latter part is mostly due to the source availability of course). In South Mexico, this focus allowed conference attendees to experience the region’s history while presenting their new research on exactly that. Coupled with the brilliant organization by the colleagues of UNAM and Oaxaca, the proximity to world-renowned archaeological sites (apart from Monte Alban, also the fascinating former Zapotec city Mitla is only a short cab ride away) made the conference week very special. Besides its historic relevance and culinary excellence, it seemed to me that Oaxaca (and Mexico specifically) had also been chosen as a political statement in the face of increasing xenophobia in the United States. 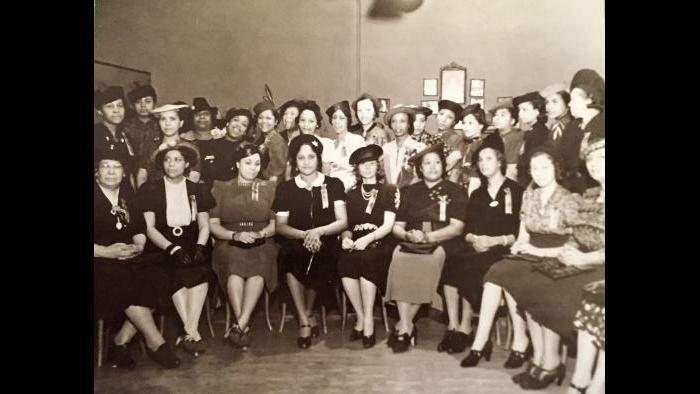 The choice reaffirmed the close connection of the Society with Mexico (especially considering that the “American” in its title does not simply refer to the US! ), and the importance of Mesoamerica for the study of Indigenous peoples and the history of the continent. Importantly, a fiery speech by the outgoing president of the Society, Matthew Restall, emphasized the need for empathy for the suffering of other people, especially Indigenous women who have been the target of violence for centuries. After five days of talks, presentations, round tables, receptions, and late-night chats, the conference came to an end. Exhausted, amazed, laden with ideas and photographs, I finally made my way back to Michigan. The week in Oaxaca had been special, but also a perfect example of the experience we as graduate students, early career researchers, and even established scholars can have at one of the many conferences throughout the academic year. Alright, why aren’t you applying yet? Through the great work of CMU’s own Dr. Lane Demas a recent item of news has come to the forefront — and one of historical note concerning former president Barack Obama’s proposed Obama Presidential Center on the south side of Chicago. Refurbishing bits of Jackson Park along Lake Michigan, the project, headed by the Obama Foundation, plans to provide a “refurbished” public space that connects the park to the lakefront. The park will also include a museum tower that tells the history of the Obamas’ story in the United States and prominently features exhibits on the history of civil rights, African Americans, and Chicago generally. Complete with Obama’s presidential library, a conference center, and a large athletic center, this project will celebrate the Obama family and provide a new public space for south-side residents. The city of Chicago has been largely enthusiastic towards the project, giving the Obama Foundation a sweet deal on the property — a $10 (! ), 99-year lease to rent and use the land. Despite a dendrological lawsuit and real estate critiques, the project continues forward. As previously mentioned, Dr. Demas’ book is award winning in many capacities. He was the 2017 USGA Herbert Warren Wind Award Winner as well as the recipient of the North American Sports Society for Sport History’s book award. Be sure to read more about the history of golf in Chicago in his monograph and keep an eye on the news concerning the course in Jackson Park. the beautiful drawing of the 15th century misericord from the Norwich Cathedral on the cover of the book was done by Robert's daughter Leah. For more than twenty years, I have been very actively involved in extensive research on structural and decorative medieval church woodwork in the British Isles, including iconographic aspects of the carved imagery. I recently fulfilled an invitation to make a presentation to Dr. Brittany Fremion’s HST 120 course to discuss several aspects of that research. I have made similar guest presentations for a number of other courses on campus in the Department of History as well as other academic disciplines. What made the presentation for Dr. Fremion’s class unique was her request that I also include why I have ultimately focused my research on ecclesiastical woodwork, and how I initially became interested in medieval church architecture. This offered me an interesting opportunity to explore, and ultimately explain how and why I developed such a passion for this line of research. I have been intensely interested in the ecclesiastical architecture from a very early age, and particularly in churches built in the Gothic style. As I was growing up on the east side of Detroit, I attended Jefferson Avenue Presbyterian Church at the edge of the historic Indian Village neighborhood, a place of worship built in 1925 in the English Gothic Revival style. One of the great joys of my childhood in that church was singing as a member of the youth choir in the large balcony at the rear of the sanctuary nave every third Sunday of the month. This wonderful vantage point allowed me to view the entire magnificent vista of the church, including the enormous soaring pipes of the Skinner organ, and the great oak-encased pulpit and choir loft, all surmounted by the great limestone Gothic archway framing the entire front chancel of the church. As a child and adolescent, Jefferson Avenue Presbyterian Church served as just one of the inspirations for the development of my great interest in medieval churches. Early in my life, I had also developed deep and driving passion for “things British,” which spurred my desire not only to visit the UK, but also to live there for a time if possible. In my junior year as an undergraduate at Central Michigan University, I was afforded just such an opportunity. I successfully applied to perform half of my student teaching as part of CMU’s very first foreign student teaching program, which had been arranged with many K-12 equivalent schools in the southern English cities of Winchester and Southampton. I was assigned to teach English Literature and History in a boy’s grammar school, Peter Symonds College, in Winchester. During the three months in early 1974 in which I lived and taught in that very medieval city, I went nearly every weekday to Winchester Cathedral after school to enjoy the quiet and unwind from teaching. I eventually became acquainted with many of the cathedral staff members, as well as some of the volunteer guides, all of whom taught me a great deal about the structures and the symbolic aspects of that great church. The single event, though, that acted as the true catalyst for my interest in medieval church woodwork was the day that one of the guides got permission to allow me into the choir stalls, where she showed me the early 13th century carved oak misericord seats that had been used for centuries by clerics and choristers. Misericord seats were cleverly designed to fold up and down like theater seats, the difference being that when the misericord seat is folded up, there is a projecting corbel ledge that allowed the clerics to rest their posteriors while mainly standing through the eight daily devotional services prescribed by the monastic Rule of St. Benedict. In other words, the upturned misericord seat allowed the clerics to stand in reverence, while simultaneously putting them at ease through those long daily services! My personal “discovery” of misericord seats, and the elaborately carved figures that are invariably found underneath their corbel ledges, is what ultimately drove my interest—my passion—for medieval church woodwork. Upon reflection, it was a long-simmering passion ignited quite by chance by a single choir stall visit. Since then, I have traveled to many medieval cathedrals, priories, abbeys, collegiate, and parish churches in England, Wales, and Scotland, spending much time examining and photographing their structural and decorative woodwork. My proudest accomplishment resulting from my research has been the publication of my reference book, Church Woodwork in the British Isles, 1100-1535: An Annotated Bibliography (2009), published under the Scarecrow Press imprint by Rowman and Littlefield. *During my years of research, which has included extensive explorations of carved symbolism and iconography, I came to realize that the church buildings were constructed as a representation of both the spiritual and the temporal world—God’s entire universe, if you will. To the medieval mind, holy imagery, which has always been predominant in medieval churches, could not exist without the context of the profane imagery also sharing these spaces. The representation of evil, of the pagan, and even of the obscene were regularly incorporated into the physical fabric of each church in order to serve as a spiritual warning and a potent reminder to actively seek the holy, and by doing so, avoid eternal damnation. Robert Faleer is faculty reference librarian in the CMU Libraries, where he has served as an academic librarian for 39 years. In addition to his book mentioned above, he has written several peer reviewed articles on various topics, and he has presented scholarly papers on this specific subject at the annual meetings of several scholarly conferences, including the International Conference on the Fantastic in the Arts, and the International Medieval Congress.